When you plan on cooking a frozen turkey for the holidays or any other occasion, the general rule of thumb is to thaw your turkey in the refrigerator for at least 24 hours for every four pounds. But if you forgot to take it out of the freezer, didn’t have room in your fridge, or purchased a frozen turkey at the last minute, you can’t wait for days. But don’t panic. 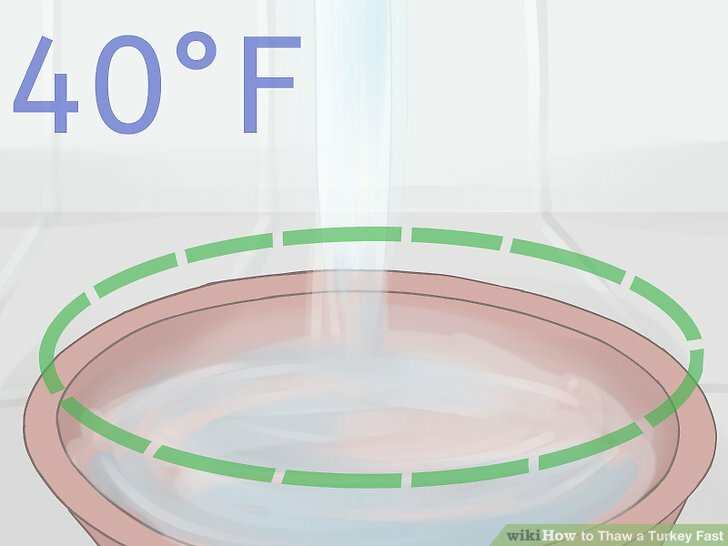 For fast thawing, you can use a basin of cool water. 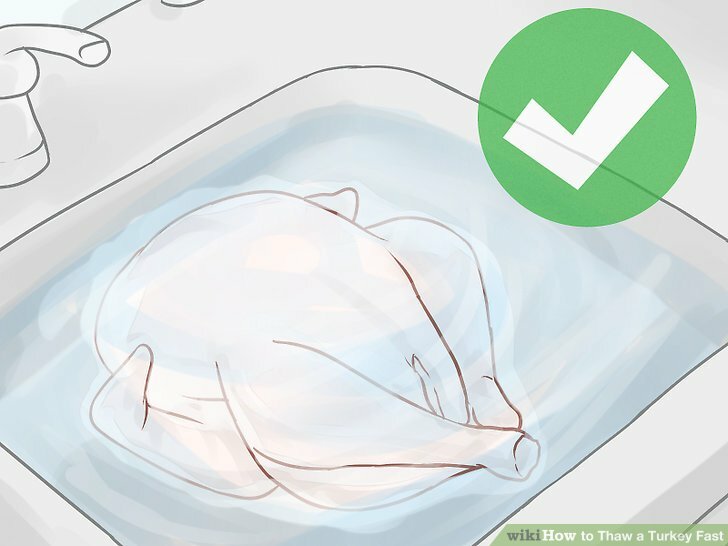 You can thaw the turkey even faster by running cool water over it. The fastest method of all is labor intensive and involves stirring the turkey by hand. Pour cool water into a clean pot, tub, or container large enough to completely hold and cover your turkey. For this method, the shape of the container doesn’t matter. The water must be no warmer than 40 degrees Fahrenheit (4.44 degrees Celsius) to avoid bacterial growth. 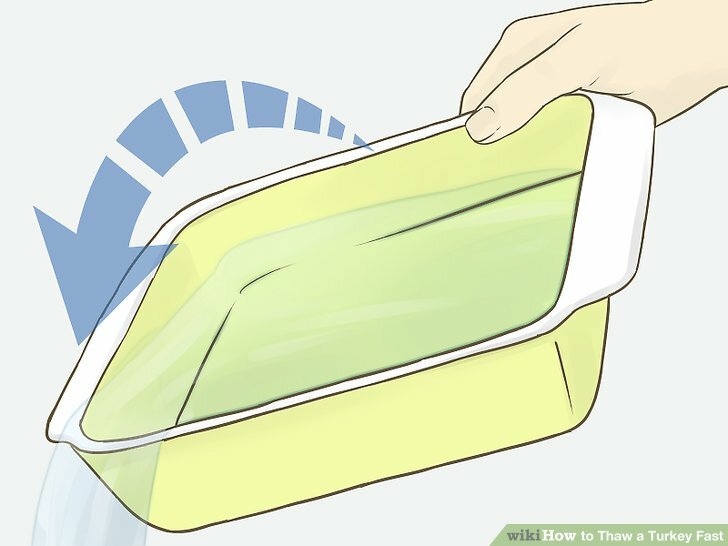 Place resealable plastic bags of ice into the container to keep the water temperature cool, if necessary. 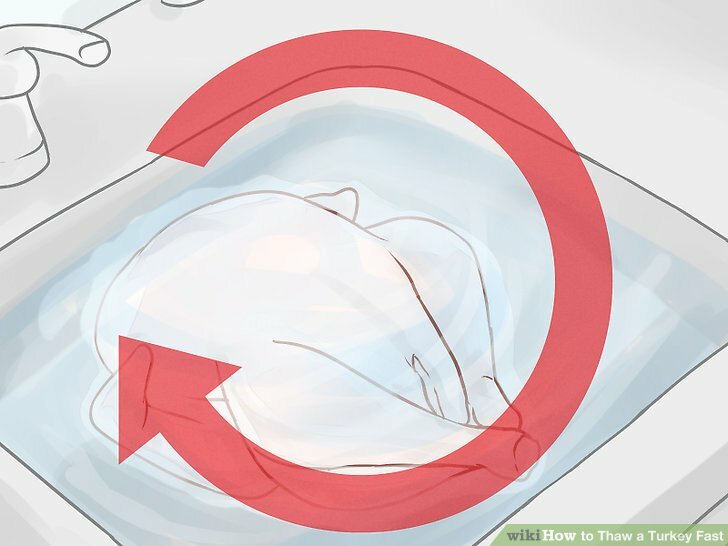 While still in its packaging, place the turkey breast-side down in the water. The turkey must be completely submerged in the water. If the turkey is not in its original packaging, place the turkey in a sealed, leak-proof plastic bag. This will help prevent cross-contamination. Use a heavy baking dish or other clean, heavy item to weigh the bird down so it stays fully submerged in the water. Remove the turkey after half an hour. After 30 minutes have passed remove the turkey and set it aside. Try not to drip everywhere. Even if the turkey was sealed, some of the water may be contaminated with bacteria. Discard and replace the water. 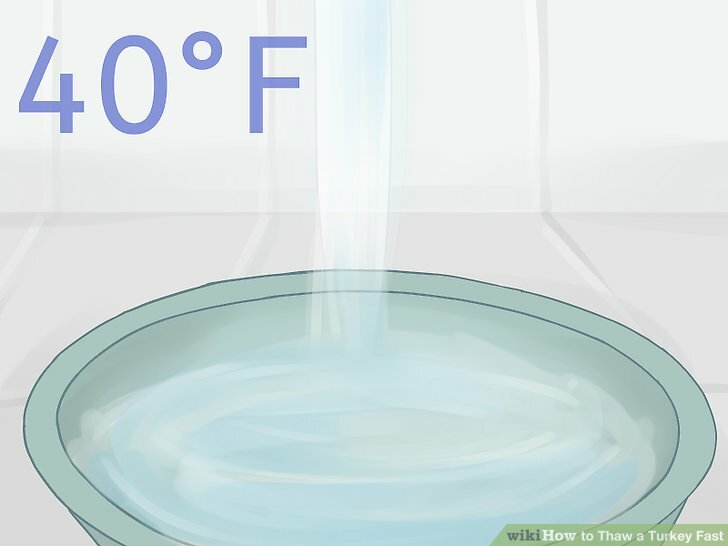 Pour all of the water out, and then replace the water with fresh, cold water. Be sure that it remains under 40 degrees, and add new ice if necessary. Place the turkey back into the water, and let sit for another 30 minutes. This method will defrost your turkey at a rate of about 30 minutes per pound. 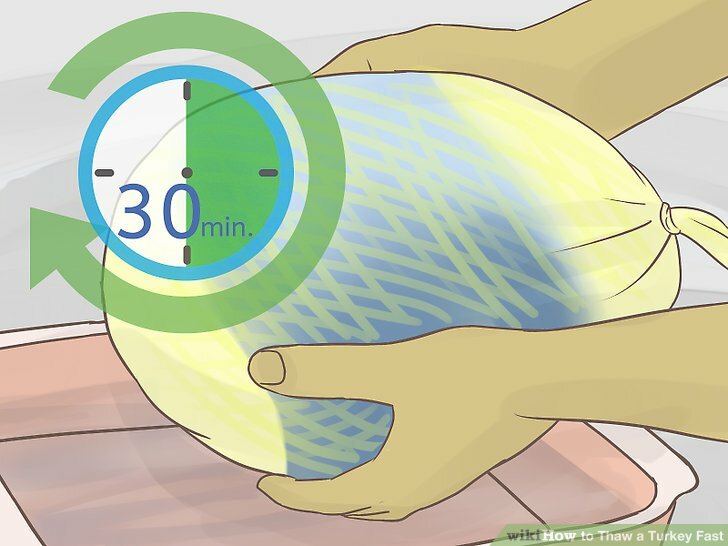 For example, if your turkey weighs 12 pounds, you must allow the turkey to thaw using this method for approximately six hours. Put the turkey into the sink or tub. This method is often necessary if you don’t have a container large enough to contain and submerge the turkey. 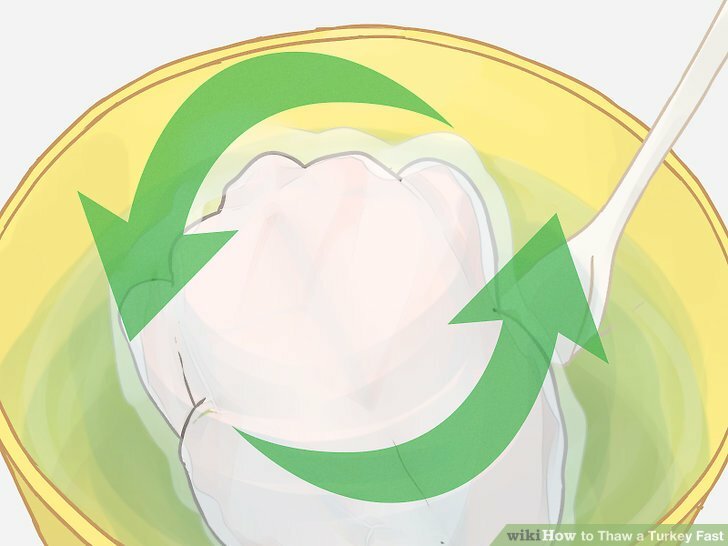 In this case, you will start by putting the turkey breast up, so the water will run into the breast. Make sure that your water is cold! Again, it will need to be under 40 degrees, in order to avoid bacterial growth. Position the turkey under the water. Make sure that the water is running over and cascading onto your turkey. You don’t want to waste water! Your turkey may develop a small pool of water around it. That is fine. Just make sure that the water can drain as new water runs over the turkey. Every five or so minutes, try to turn or rotate the turkey. Lay it on its breast, turn it sideways, or rotate it. Make sure that it stays under the water. You’ll want to ensure that the turkey is under a slow, steady stream of water. You’ll need to keep doing this until your turkey thaws. There isn’t a specific formula as there are for some other methods, so you’ll need to use your judgment. The smaller the turkey and the better the water flow, the faster it will thaw. You can poke the thick, meaty parts of the turkey like the breast and thighs to see if they feel thawed. If your turkey felt soft enough, you will still want to test it further. 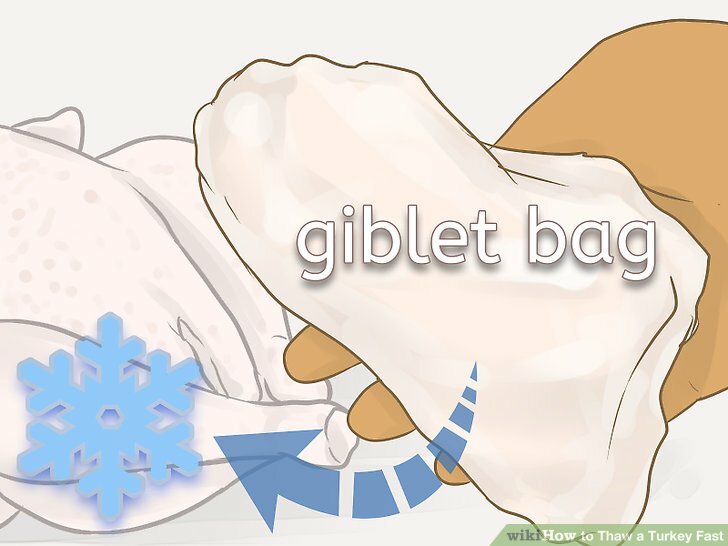 The easiest way to do this is by examining the chest cavity and removing the giblet bag. If the chest cavity still has ice crystals, or if the giblet bag is still frozen in, you need extra time. Pour cool water into a clean pot, tub, or container large enough to completely hold and cover your turkey. In this case, you will ideally want the container to be round. 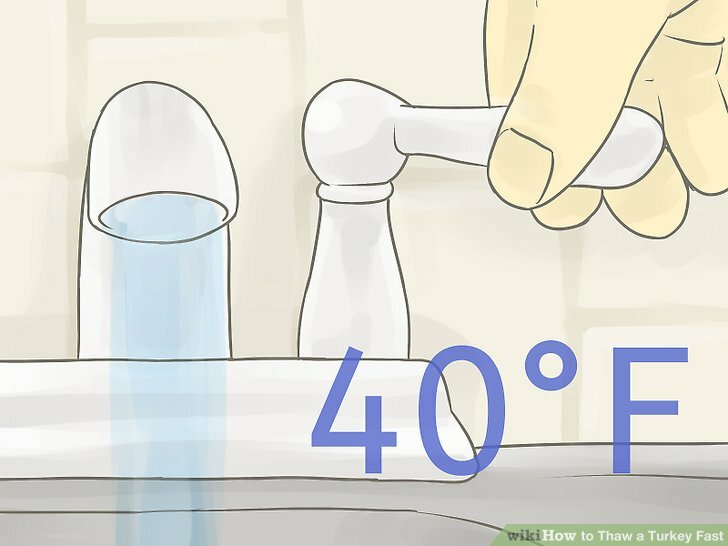 The water must be no warmer than 40 degrees Fahrenheit (4.44 degrees Celsius) to avoid bacterial growth. Since you will be stirring, ideally the container will be round or cylindrical. 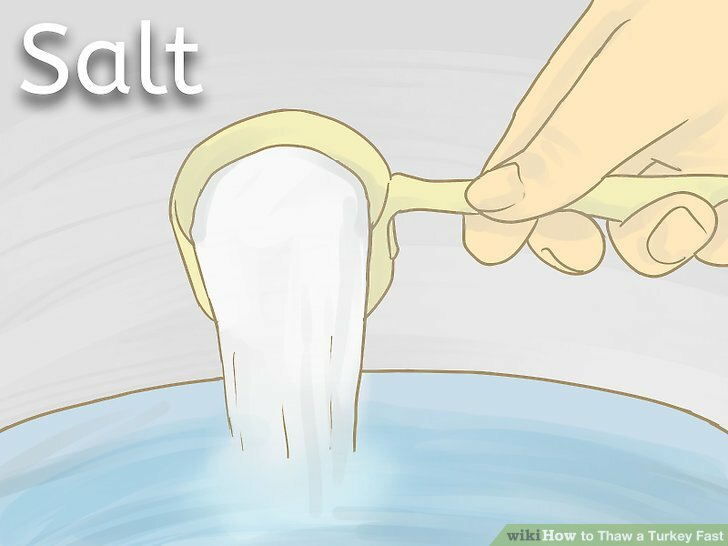 Salt helps reduce the freezing temperature of water. The chemistry behind this is why it is used during icy weather. While your turkey isn’t a winter highway, it can use some ice too. Add a generous helping of salt to the container. Half a cup of salt per gallon of water is a good place to start. Place the turkey, breast side down, in the water. It can remain in its original packaging, but this will be quicker if you remove it so that water can circulate in the chest cavity. Since you won’t be changing the water you won’t have to worry about bacteria-laced water dripping around. You can either stir the water or spin the turkey with a ladle or large wooden spoon. By keeping the turkey in motion, you speed the rate at which it comes in contact with the water and transfers heat. This is why a round container is helpful. You’ll need to work much less hard to keep the water circulating. The time you need will depend on the size of your turkey as well as your stirring skill. Test the turkey by prodding the breast to see if it is soft. If you think it is done, confirm by examining the chest cavity and removing the giblet bag. If the chest cavity still has ice crystals, or if the giblet bag is still frozen in, you need more time stirring.